The Down's Syndrome Doll was designed to promote self-acceptance and self-identification of people with Down's Syndrome. The down syndrome dolls are available with their mouths open or closed. A doll with a closed mouth will help educate a child to keep their tongues in their mouths. 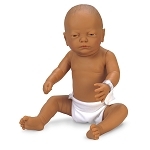 The doll is ideally suited and educationally beneficial as a toy for the non-disabled as well. The appearance of the doll can result in its arousing more sympathy and thoughtfulness than other dolls. Learning from play and appreciating the environment contributes to better understanding and acceptance of people with disabilities. 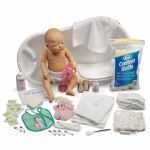 These special dolls have been especially successful in hospitals, pediatric practices, Down's Syndrome Associations, kindergartens and nursery schools. 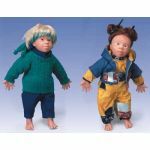 Start promoting self love and acceptance today with these realistic and educational down syndrome dolls.